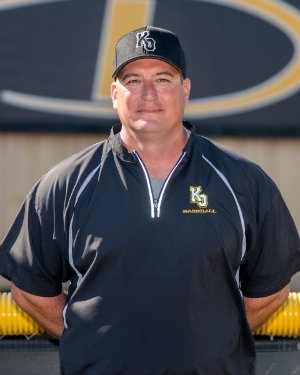 Head Coach Bo Hernandez joined the Klein Oak Baseball program at the start of the 2003-2004 season. Coach Hernandez hails from Conroe, Texas, where his Mom and Dad still reside. Coach Hernandez graduated from Conroe High School where he played both football and baseball. Coach Hernandez went on to play baseball at Galveston College 1991-1993, where again he was a standout as a pitcher. He was awarded both All Conference and All Region honors. He was then honored to be part of the pitching staff at the University of Houston from 1994-1996 while he continued his college studies, and earned a degree in Kinesiology and certification to teach in the areas of P.E., Health and Special Education. In December 2004, Coach Hernandez married the former Dayna Zelonish. Dayna, who has proved to be a faithful fan, has two sons, Tony and Tyler. Dayna also serves within the district as Executive Director for Elementary Teaching and Learning. Prior to Coach Hernandez’s current position at Klein Oak, Coach Hernandez taught and coached in Trinity, Conroe and Humble. He tells us that he was drawn to Klein Oak by the reputation of KO's baseball program and the caliber of student/athletes that it produces. Also, the KO community and the reputation of KISD were factors in his decision to accept his position. After serving as Assistant Head Coach, Bo was elevated to Head Coach during the summer of 2010. His other responsibilities at KOHS are coaching freshman football as well as teaching Credit Recovery & Virtual School. His personal goals in both areas are to bring the best out of his students and every athlete.